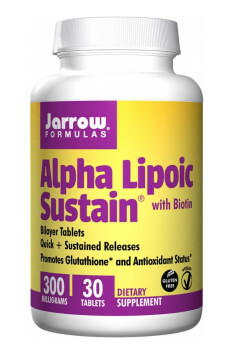 Jarrow Alpha Lipoic Sustain with Biotin is a dietary supplement containing alpha-lipoic acid and biotin. The unique formula of the tablet, in the composition of which there is the form both with slow and fast release, allows to efficiently absorb the substance and lastingly maintain it in the organism. The preparation supports the reduction of oxidative stress, supports maintaining proper glucose level in blood and facilitates elimination of toxins from the organism. An additive of biotin supports the activity of alpha-lipoic acid and positively influences the state of skin, hair and nails. Alpha-lipoic acid (ALA) is a compound soluble both in water and fats, fulfilling multiple functions in the organism. Its main role is neutralizing the excess of free radicals, chelating metal ions and regenerating other substances with antioxidant effect, such as vitamin C and E. Alpha-lipoic acid also takes part in regulating fat and carbohydrate metabolism and most importantly – it has the ability to cross blood-brain barrier, thanks to which it reaches the majority of tissues of the organism and is incredibly effective. Free oxygen radicals are indispensable to the proper protection of the organism against pathogens and also they take part in many metabolic reactions. Unfortunately, there are many factors leading to their excessive production (i.a. stress, improper diet, excessive physical activity) and this may pose a serious threat to the organism and be the cause of many diseases and dysfunctions in the proper functioning of the organism. Alpha-lipoic acid has the ability to interact with free radicals and incapacitate them. According to the scientific research, this compound participates among others in sweeping hydroxyl radicals, hypochlorous acid, peroxynitrite and singlet oxygen. Its antioxidant properties are also connected to the mechanism consisting in chelating metal ions. These ions in the state unconnected to proteins may have a harmful influence on cells, as they take part in the reactions of oxidation-reduction, which may lead to the creation of hydroxyl radical, characterized by high reactivity. Alpha-lipoic acid, by binding metal ions (i.a. manganese, zinc, copper and lead) may prevent unbeneficial consequences of oxidative stress. Alpha-lipoic acid may demonstrate both direct and indirect effect against free oxygen radicals. It has been observed that this compound has the ability to regenerate intercellular antioxidants. Alpha-lipoic acid influences the increase of the level of antioxidants, such as: glutathione, vitamin C and vitamin E. The growth of the concentration of glutathione contributes to the increase of the activity of processes leading to the regeneration of vitamins C and E.
It has been observed that this compound has hypoglycemic properties and its antioxidant effect may also turn out to be helpful in case of diabetes and insulin-resistance. Alpha lipoic acid may positively influence the stabilization of glycaemia and also may contribute to increasing sensitivity to insulin and lower the risk of diabetic neuropathy. The mechanism of the activity of hypoglycemic alpha-lipoic acid consists in, among others, limiting the accumulation of triglycerides in the pancreas, which may lead to the damage of β cells as well as in increasing the activity of insulin against the processes consisting in retrieving glucose from muscle cells. Moreover, the influence of alpha-lipoic acid on metabolic changes of glucose has been observed, which is demonstrated by inhibiting gluconeogenesis and stimulating the process of glycolysis. Alpha-lipoic acid may counteract dangerous consequences of poisonings among others with mercury, arsenic, lead and cadmium. The mechanisms consisting in the protective effect of this compound are various depending on the metal. However, it has been observed that alpha-lipoic acid may for example contribute to limiting the absorption of arsenic from the digestive tract or increasing elimination of mercury with bile and removing it from kidneys. This advantage of alpha-lipoic acid may also be attributed to its antioxidant properties. This compound, by increasing the concentration of antioxidants, increases the protection of nervous tissue and counteracts its damage as a result of the activity of toxins. Biotin, known as „the vitamin of beauty” is a substance helping to maintain optimal activity of alpha-lipoic acid. This vitamin improves the state of skin, hair and nails and also supports energy changes of the organism and facilitates the functioning of the nervous system. Proper supply of biotin helps in excessive hair loss, weak nails, worse state of skin and other dermatologic problems. Summing up, Alpha Lipoic Sustain with Biotin is a dietary supplement with high antioxidant potential, which by many mechanisms of operation may positively influence the state of health and cause the improvement of life quality. Many benefits resulting from using alpha-lipoic acid make the product an effective weapon in the fight with oxidative stress and by the same token help to reduce pathological changes accompanying i.a. atherosclerosis, diabetes, inflammations and poisonings with heavy metals. An additive of biotin in the preparation not only supports its activity, but also may improve the condition of skin, which may constitute an additional benefit in case of people dealing with dermatological problems. Alpha Lipoic Sustain with Biotin 30 tab. The standard dose of alpha-lipoic acid is usually 300-600 mg, which corresponds to 1-2 tablets of the preparation. With the aim of prophylaxis, it is best to use 1 tablet a day, while in case of diabetes and increased physical activity, it is worth increasing the dose to 2 or even 3 tables a day. Because of the fact that alpha-lipoic acid is very well-soluble both in water and fat, it does not have to be taken with a fatty meal. Its absorption does not require the presence of fatty acids in the intestines, therefore it may be taken also on an empty stomach. Polyacrylate Polymer, Calcium Phosphate, Cellulose, Stearic Acid (Vegetable Source), Magnesium Stearate (Vegetable Source), Silicon Dioxide, Vanilla And Beet Root Powder (For Color).